The Swiss and Vodafone McLaren Mercedes have joined forces to come up with a revolutionary new timepiece, the TAG Heuer Formula 1 Chronograph 42mm CAU1110.BA0858. This watch is anything but dull. Who says a sports watch needs to look like a sports watch? Here is your chance to be practical as well as stylish. As far as sports watches go, there is no other one than this Formula 1 that is more aesthetically pleasing. Its black dial with large 12 and detailed steel bezel made with black titanium carbide give it its signature bold physique. Its fine-brushed steel case and polished steel band add a nice contrast and definitely class it up. You will be the talk of the town with this beauty on your wrist! And because of its double security folding clasp feature, you will always be guaranteed that it will stay on your wrist. Jensen Button racing in Grand Prix. This is not your average high-end “pretty” watch either. The quality of this watch is backed-up by extreme manufacturing standards and meticulous testing. Though pleasing to the eye, this Formula 1 is much more than its looks. It has been tested under racing conditions by Jensen Button, proving that it is able to withstand extreme circumstances. Quartz chronographs, like this watch, are powered by a battery and use a quartz crystal for a regulator, or simply what watches use to tell time. Precise time measurement is accomplished by an electrical current, which causes this quartz crystal to vibrate at a controlled and fast pace. So you can be sure about this Formula 1’s dependability and durability. 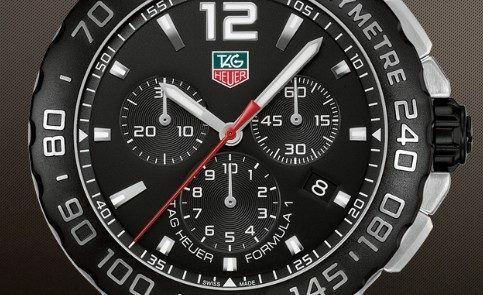 This TAG Heuer measures time with accuracy up to 1/10th of a second. These quartz chronographs are capable of timing up to 12 hours and have simple time measurement and additional time measurement functions. It also has three chronograph counters for measuring hours, minutes and seconds. As if those weren’t enough, it also features a tachymeter scale on its bezel to calculate the average speed of a car, for example by measuring the time taken to cover a given distance. Though the watch’s abilities may seem overwhelming, simple push buttons make them quite uncomplicated. 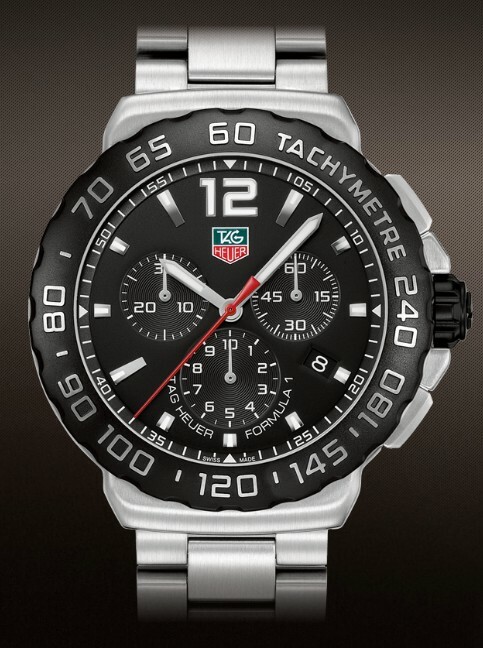 This TAG Heuer is certainly a great watch to have with all its practicality and style. It goes for about $1,175 which is an incredible steal at this watch’s level of quality. You will definitely be getting your money’s worth with this Formula 1’s sturdiness and you will get many uses out of it. I would highly recommend this purchase.